In continuing to try to get all the painting projects done before move-in day, I spent the better part of yesterday (9 hours!!!) 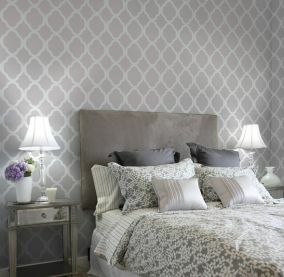 stenciling a feature wall in what will be my master bedroom. While visiting Home Depot for the gazillionth time, I saw that Martha Stewart has a new line of metallic paints. I toyed with the idea of painting the entire room with Tin, a silver metallic, but after doing some test swatches and reading up a bit on metallic paints, I found out it would take many coats to get even coverage. Instead I decided I would try a stencil. Perhaps when you think 'stencil' what comes to mind is apple borders around kitchens or some cheesy mural of ancient Rome, but stencils today are really 'sick' (vocab picked up from my teenage students...'sick'= 'great' or 'awesome' or 'swell', depending on your age). The room combines elements from all three of the above images (first image found here, second and third images are from the stencil links below). 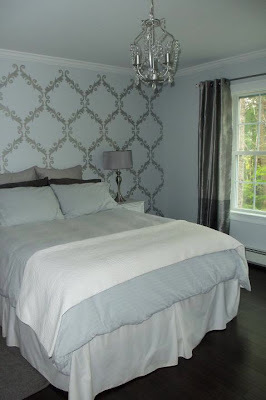 I used the silver metallic Martha Stewart paint pictured in the first image (the stencil), with the stencil pictured in the second image, and am going for an overall gray theme in the room pictured in the third image. The first step is to find the center of your wall. You want to start your stencil at the top and in the center of your wall and then make your way to the outer edges. I sprayed the back of the stencil with the repositionable adhesive then lined it up at the top of the wall. *Important learn-from-my-mistake- note: I sprayed more adhesive on the stencil after every 3 or 4th stencil to make sure the edges remained 'crisp'. This was a mistake...toward the end, the stencil became so sticky that it ripped off some of the wall paint when trying to remove it. I would recommend using the adhesive sparingly. Next, load your foam roller with paint. It is important to roll the excess paint off the roller and on to your scrap card board. You want to go to the wall with minimal paint on the roller. Then roll...be very careful to avoid obvious roller marks and lines when rolling on the stencil. I used two coats and pulled the stencil off immediately after the second coat. Because of the style of stencil, you can't really see mistakes all that well...they just blend right in! The awkward part comes at the edges. On the outer edge, I had enough room to do a half stencil on either side. But on the bottom, there wasn't really enough room to do even a half of a stencil so I just decided to leave it and figured the furniture would cover it up! Thanks, Carrie! It took FOREVER but I love the look of metallic paint! Your house is beautiful!!! I'm a teacher searching for my first house and I def want to use this idea for my bedroom. I have 1 question. Was their a certain time you had to wait before applying the second coat of paint, or was it just right after the first coat? Thanks! Hi Sarah! I just waited a few minutes before rolling on a second coat of metallic paint, then removed the stencil immediately. As mentioned in the post, using a hair dryer can also speed up the process between each stencil application. 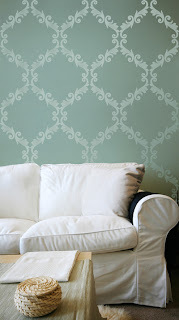 Good luck with your home search and your stenciling!